We've all been there as undergraduates or researchers- the dreaded research poster. My personal experience was not a good one, but very memorable. After doing the research with sleepless nights, we confront powerpoint, images, formatting and a whole other field we have to dominate in X amount of days so that we can transform our work into poster art. I do not know why making posters are not introduced into the learning process early on. There was a great post on the RSC's Education in Chemistry blog called Student Posters on Chemistry Topics that gives resources to teachers and explains the importance of posters throughout the learning process. My comment prompted this post. In my Safety of Chemicals class, Dr. Koll had us create "wanted posters" for an assigned toxic/hazardous chemical. 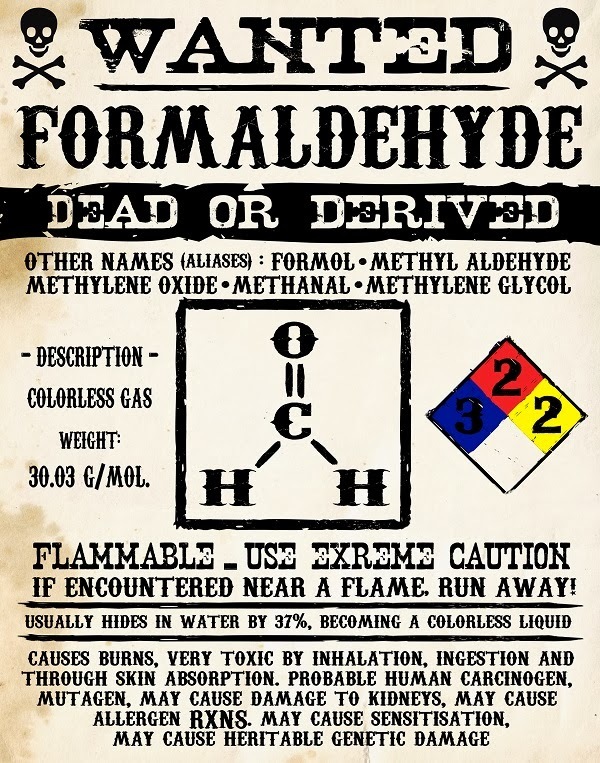 I was assigned formaldehyde and this is what I made. Safety, chemistry and art can be combined to give us practice in arranging information in poster format. The one thing that makes chemistry so much fun, is being knowledgeable in the safety aspect while performing experiments.